The ESOL Odyssey: A Back to School FREEBIE for you! A Back to School FREEBIE for you! I don't know about you, but so far, my summer has not gone at all as planned! We've had family crises, medical problems, car trouble, and so much more that has kept me away from blogging, creating materials, and getting ready for next year. Fortunately, for the first time in my career, I will be at the same school, in the same classroom and working with the same grade level, so that will save me a little bit of time. One of my favorite parts of the year is the get-to-know you activities that I do with my students at the beginning of the year. Despite the chaos I have experienced this summer, I did have a chance to put the finishing touches on some of my favorite beginning of the year activities. The first one is a limited time FREBIE for you- my Get-to-Know-You Cootie Catchers! There are two cootie catchers in this download (labeled A and B). Pair students off, give one cootie catcher A and give the other cootie catcher B. Then let them take turns asking questions. If you have time, they can switch cootie catchers and ask their partner new questions. Just click the picture below to download! The next fun activity that I've been putting the finishing touches on is my All About Me Report Posters. The students usually take these home and have a great time completing them. When they bring them back, I give them the opportunity to share with their classmates, then I make a display in the classroom for about a month. When I take down the posters, I save them to use for Student of the Month displays. These posters can be printed on legal paper or you can use a poster printer! 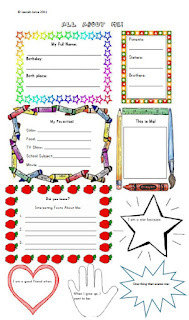 These All About Me Report Posters are only $1.25 in my TpT Store. Just click the picture below to go! I hope you enjoy the rest of your summer! Take some time out for yourself too.